Ministar Columbine is a unique dwarf flowering Columbine. It will bloom from late spring to early summer. It has blue and white blooms. It will grow to a height of 6" to 8" tall and just as wide. This plant likes to be planted in rich, moist soil in full sun to light shade. Plant so this gets afternoon shade from the hot sun. Use Ministar Columbine in the front of perennial beds, small clumps or massed together for a explosion of color. 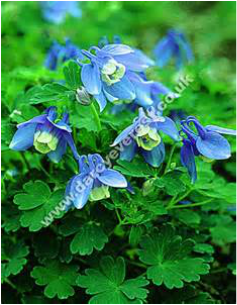 Works great when planted in a Cottage Garden or Woodland Garden. Ministar Columbine is great for a cut flower and makes great indoor bouquets. Ministar Columbine is deer resistant and will attract hummingbirds and butterflies when in bloom. Remove flowering stems after blooming to encourage additional blooms. Keep the soil moist after blooming to prolong attractive foliage appearance. When the foliage starts to die back, foliage may be cut to the ground. Mulch heavily around the base of the plant to protect the roots during the winter.